Matthias Geyer studied Physics in Kiel, Bonn, and Heidelberg and graduated in Biophysics at the Max Planck Institute for Medical Research in Heidelberg. Working in the department of Kenneth C. Holmes he was trained in structural biology with an emphasis on nucleotide-binding proteins. In 1999 he moved as a research assistant to the HHMI laboratory of Matija Peterlin at UCSF. 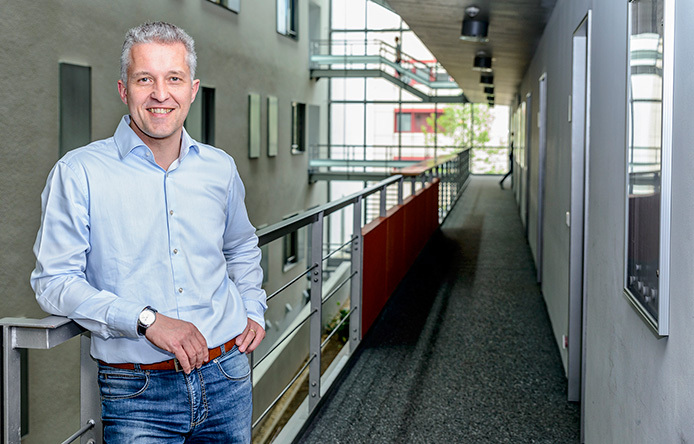 Coming back to Germany, he spent 10 years as an independent research group leader within the Max Planck Society, working at the Max Planck Institute of Molecular Physiology, Dortmund, and the Research Center caesar, Bonn. He obtained the habilitation in biochemistry from the Medical Faculty at Heidelberg University. In 2014, he joined the Institute of Innate Immunity headed by Eicke Latz at the University of Bonn, setting up a research department in biochemistry and structural biology. Since 2015, he is a core member of the excellence cluster ImmunoSensation and appointed to the Cluster Chair of Structural Immunology. In 2017, Matthias Geyer became the founding director and chair of the Institute of Structural Biology at the Medical Faculty of the University of Bonn. Dr. Geyer is using a broad range of biochemical methods to determine protein–protein interactions as well as the interaction to lipids, nucleic acids, and small molecular ligands. His laboratory is applying X-ray crystallography, NMR spectroscopy, and electron microscopy for the structural analysis of protein complexes. His group investigates the activation and formation of the inflammasome, the regulation of eukaryotic transcription, and the remodelling of the actin cytoskeleton. Copyright © 2019 Institute of Structural Biology. Alle Rechte vorbehalten.